Karen Witemeyer is a deacon's wife and mother of three who believes the world needs more happily-ever-afters. To that end, she combines her love of bygone eras with her passion for helping women mature in Christ to craft historical romance novels that lift the spirit and nurture the soul. After growing up in California, Karen moved to Texas to attend Abilene Christian University where she earned bachelor and master's degrees in Psychology. It was also there that she met and married her own Texas hero. He roped her in good, for she has lived in Texas ever since. In fact, she fell so in love with this rugged land of sweeping sunsets and enduring pioneer spirit, that she incorporates it into the pages of her novels, setting her stories in the small towns of a state that burgeoned into greatness in the mid-to-late 1800s. When a dressmaker who values beauty tangles with a liveryman who condemns vanity, the sparks begin to fly! Jericho "J.T." Tucker wants nothing to do with the new dressmaker in Coventry, Texas. He's all too familiar with her kind--shallow women more devoted to fashion than true beauty. Yet, except for her well-tailored clothes, this seamstress is not at all what he expected. Hannah Richards is confounded by the man who runs the livery. The unsmiling fellow riles her with his arrogant assumptions and gruff manner, while at the same time stirring her heart with unexpected acts of kindness. Which side of Jericho Tucker reflects the real man? When Hannah decides to help Jericho's sister catch a beau--leading to consequences neither could have foreseen--will Jericho and Hannah find a way to bridge the gap between them? 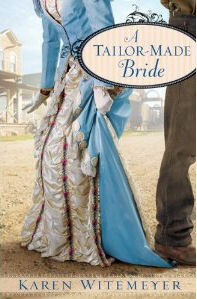 If you would like to read the first chapter of A Tailor-Made Bride , go HERE.